I was recently looking through some of the excellent images made available by the J. Paul Getty Trust when I came upon this striking stereograph view. The original label describes it as “Gen. Thomas Francis Meagher, surrounded by a portion of his command.” It is No. 2052 of the War Views: Army of the Potomac series published by E. & H.T. Anthony & Co. at 501 Broadway, New York. The image is rarely used, which is somewhat surprising given the strength of the composition. 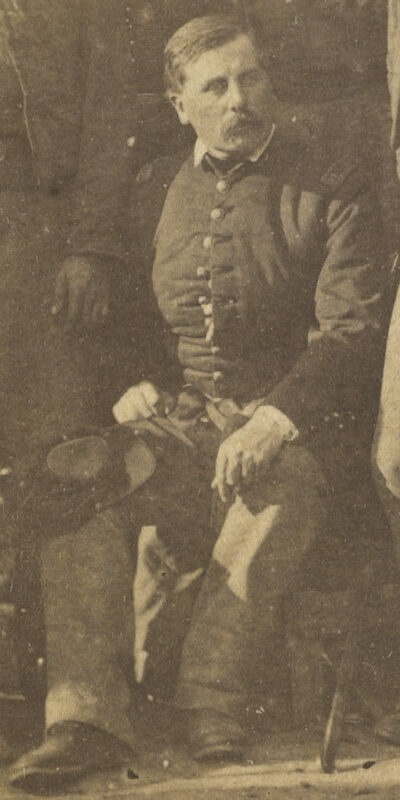 Despite the title, examination of the men clearly indicates that this is Thomas Francis Meagher before he was a General. 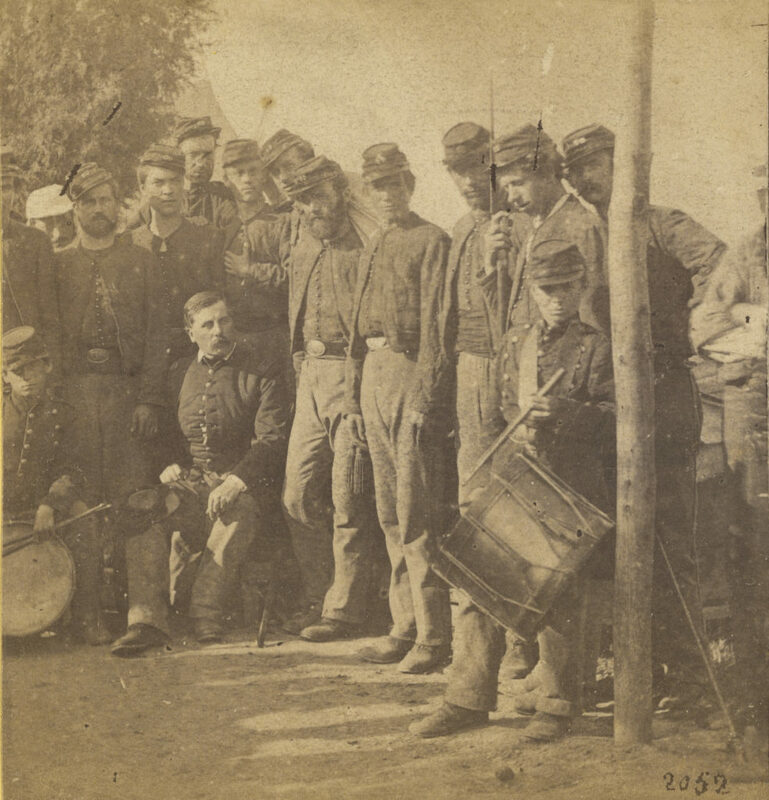 Both his uniform and those pictured with him give it away– this is Thomas Francis Meagher as an officer in the 69th New York State Militia, surrounded by 69th New York zouaves of his Company K. Though the Getty catalogue entry dates the image to 1862-1864, this was exposed in the summer of 1861, likely in Virginia just prior to the Battle of Bull Run. The significance of this photograph has been recognised before, most notably by historian Joseph Bilby in The Irish Brigade in the Civil War. 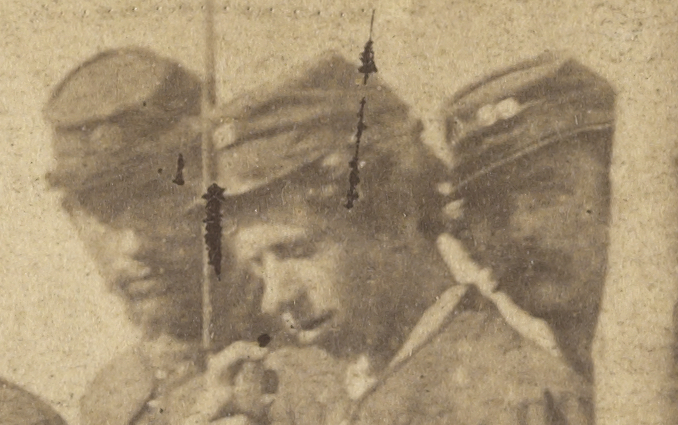 The high-resolution version provided by the Getty Trust presents us with an opportunity to examine it in close detail, a rare chance to see the faces of some of the ordinary men of the 69th who participated in that momentous engagement on 21 July 1861. We are left to wonder which of them were still standing afterwards. *I am grateful to Harry Smeltzer of the excellent Bull Runnings for his assistance and advice with this post, together with historians Joseph Bilby and Catherine Bateson. The J. Paul Getty Trust, Getty’s Open Content Program. Gen. Thomas Francis Meagher, surrounded by a portion of his command. [Army of the Potomac]; Edward and Henry T. Anthony & Co. (American, 1862 – 1902); about 1862 – 1864; Albumen silver print; 84.XC.979.1562. Gift of Weston J. and Mary M. Naef. As research so often does, my own led me to a side interest in the mid-nineteenth century New York fire departments. I always look forward to your posts, and this one brought tears to my eyes. Those early volunteers are, for me, really what the war stood for–a chance to prove one’s loyalty and a chance to earn citizenship. 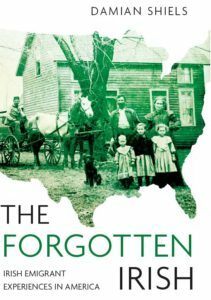 These faces are the faces not only of Ireland but of America. Thank you, as always.